This podcast features an interview with Jonah Casebeer, a 17 year old family friend and rising senior at Thomas Jefferson High School for Science and Technology (TJ) in Alexandria, Virginia. Jonah and three of his classmates entered the annual “Battlecode” Artificial Intelligence Programming Competition at MIT along with about 400 other teams in the fall of 2014. Their team was selected among 16 finalists to fly to MIT for the live, final competition, which was livestreamed on Twitch.TV. They were the only team comprised of high school students in the 2015 competition. All the other teams (ranging from 1 to 4 members) included undergraduate and graduate students, along with adults out of college. According to the Battlecode.org website, “The 6.370 Battlecode programming competition (also 6.147) is a unique challenge that combines battle strategy, software engineering and artificial intelligence. In short, the objective is to write the best player program for the computer game Battlecode. Battlecode, developed for 6.370, is a real-time strategy game. Two teams of robots roam the screen managing resources and attacking each other with different kinds of weapons. However, in Battlecode each robot functions autonomously; under the hood it runs a Java virtual machine loaded up with its team’s player program. Robots in the game communicate by radio and must work together to accomplish their goals. Teams of one to four students enter 6.370 and are given the Battlecode software and a specification of the game rules in early January. Each team develops a player program, which will be run by each of their robots during Battlecode matches. Contestants often use artificial intelligence, pathfinding, distributed algorithms, and/or network communications to write their player. At the final tournaments, the autonomous players are pitted against each other in a dramatic head-to-head tournament. The final rounds of the MIT tournament are played out in front of a live audience, with the top teams receiving cash prizes. The total prize pool is over $50,000.” In this podcast interview, Jonah tells about his experiences in the 2015 Battlecode competition as well as about the preparatory courses he took at TJ which prepared him and his teammates for this extremely fun and challenging activity. Check out the podcast shownotes for links to referenced sites, videos and resources. 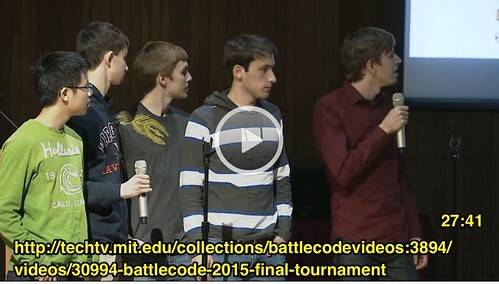 In the 3.5 hour video of the 2015 Battlecode Tournament, Jonah’s team “Puzzle” takes the stage at 26:05.